My current home is right besides the Banani lake in Dhaka, Bangladesh and from the big window in my room, I am blessed with a mesmerizing view. The lake is mostly empty except for a few boats which keep plying in the lake ferrying people from one end to another. Some boats make the regular short ferrying trip across the breadth of the lake & some make the longer one across its length. 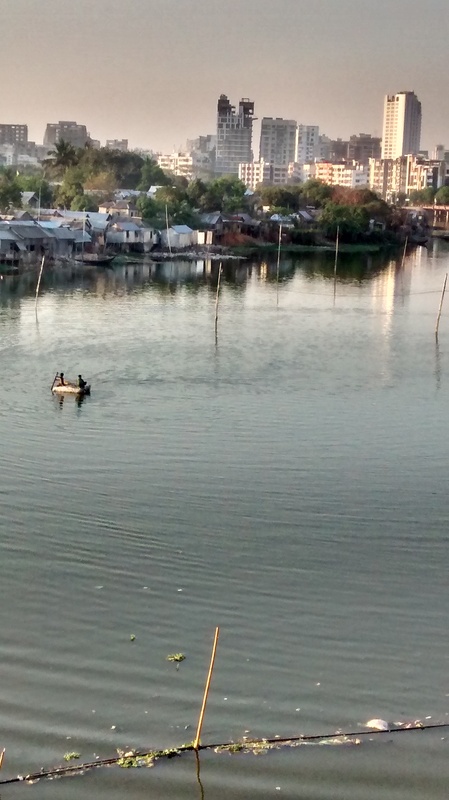 However, around mid day yesterday, for the first time I saw a small boy sitting on a round makeshift boat like thing trying to go nowhere. I could see him making a lot of effort with the paddle but somehow his boat, being unstable, was mostly going round and round in circles. However, along with completion of each circle, he was moving a bit ahead too. I was highly bemused and sat down and watched him for he seemed to be the only one without a purpose of moving in any direction. Seeing the little boy in the small boat amidst water all around somehow connected me to my own struggle in this Samsara(World). I resonate how I, the ego, has been doing the same thing. I am going round and round in circles. Despite being surrounded by uncertainty all around, I love to live in the illusion of certainty; refusing to see the reality as it is; refusing to acknowledge not knowing it all. Like the boy in the boat, I am also surrounded by many people(boatmen), who all seem to be moving with purpose; going around with their daily lives with clarity and doing the same things repeatedly. Seeing them, I too like the boy want to surge ahead, aiming to reach the other end; I too want to define things, attune a purpose to it all. Like the boy, I too despite knowing I am going around in circles, still live under the illusion of moving forward. Like him, I too am refusing to see that the other boatmen are also going around in circles, albeit bigger than mine and thus, are as lost as I am. I refuse to see that there is no forward or backward, that there is no shore I have to reach upon. However, there is definitely a part within me(stronger than ever before) which sees the futility behind it all; which has accepted and embraced both the uncertainty and Maya(the grand illusion) as parts of the journey. It realizes the go round and round in circles, it knows there isn’t a purpose or meaning; no sense to be seeked, attained or achieved. It sees life as a beautiful journey meant to simply be lived, to simply float and flow through. It understands the sync between the individual will and divine will; it feels them as one rather than separate. However, the struggle within is far from over. The going round and round is still on and so is the desire to consistently move in the direction perceived as forward. The mind at times is so in control of the senses and desires that those are the only things it caters to. However, its grip has starting to loosen and as and when the energy shall so desire, It shall be released. “… it knows there isn’t a purpose or meaning; no sense to be seeked, attained or achieved.” This is such a difficult thing to understand and accept, yet so liberating once it has been gotten.